You already know that high-quality maintenance tools like this AW Perkins POE Wood Stove Ash Rake can help you keep your stove running efficiently. But did you realize that this effective ash rake can also act as an eye-catching piece of decor? Its unique design and classic style allow this hearth tool to give your stove an aesthetic boost as well as a practical one. Even a gas stove can benefit from the addition of an AW Perkins POE Wood Stove Ash Rake. How wide is the rake head on the ash rake? 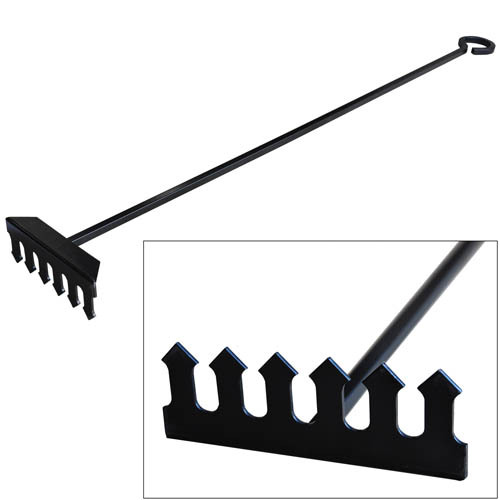 Per the manufacturer, the width of the rake head is approximately 6 inches. Great addition to fireplace tools! This rake works great. Allows me to bring the coals to the forward part of the stove where they burn and reduce to ash. This was a great purchase. I highly recommend it. Great tool to use for moving wood and ash in the fireplace. Nice long handle and made well. ProsLong handle, rake separates ash from coals. This is hands down the best purchase we made for our wood stove. It's sturdy and works like a charm. A must have tool for a wood stove. At first, I was concerned that the handle length was too long but I'm glad I tried using it before cutting the handle down. I realize now that the extra length keeps me away from my stove while I'm raking the coals which means I don't get nearly so hot. I didn't like the barbs on the sides of the tines so I ground those off. I really like this rake and I'm glad I bought it. I gave it 4 stars instead of 5 because some of the paint already chipped off of the handle. Great product well made I like the 36 inch length no hot hands now/ , I burn 24 inch wood. This was just what we needed to deal with the ash in our wood stove. This design is different than the other ash rakes we saw. The only reason I didn't give it four stars is I wish the handle were shorter.